3 BR; 3 Bath Condo with dock rights. Peak Season requires at least 3 or more nights arriving or departing on a Saturday. July to mid-August requires a 7 night minimum. 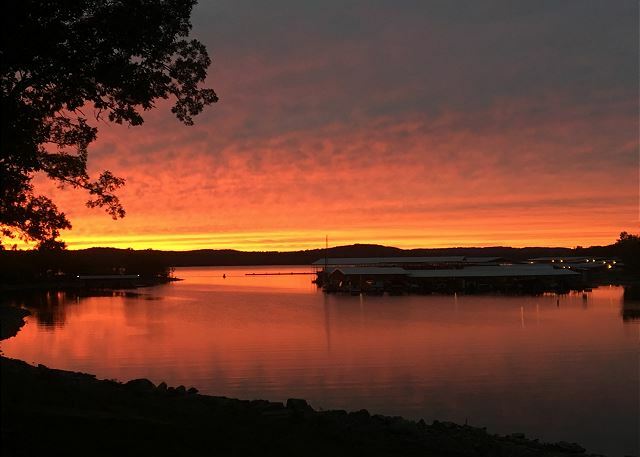 Enjoy watching the sunset or the moon shine on Table Rock Lake from your large private balcony. Among the other amenities, this lower level condo looks over the lake, with approx. 1400 sq. ft. to offer you a clean, comfortable stay. While here enjoy the fully furnished kitchen with beautiful granite counter tops and much more. Go fishing, rent a boat or take a dip in the lake or pool. What a great vacation for the whole family! The guests of this 3 BR, 3 Bath condo located at Vickery Resort enjoy granite counter tops, washer, dryer, a full kitchen stocked with all the appliances and utensils needed to prepare a gourmet meal, large bedrooms, a master bedroom that looks out onto Table Rock Lake. The large 32-34' private deck overlooks a secluded cove on Table Rock Lake. Your sure to not be disappointed with this condo. Nice spot on the lake, not too far from town. Beautiful condo stocked with everything we needed to do our own meals. Wonderful enclosed deck that we enjoyed sitting out on playing games. Comfy beds, spacious accommodation, perfect for our group of 7. Colleen was wonderful to work with, she is on top of everything. Would definitely stay here again! we love this place. Very convenient for boating and close to all the shows. It has anything you need for cooking, grilling, laundry. Very family friendly and clean. Highly recommend. Every year my family meets in the Branson area over the 4th of July for a family reunion. We were lucky to get to go this year and lucky to have been able to stay in the same resort. Thank you to the staff of Vickery Resort for helping us find the perfect condo. It was beautiful and well maintained. This condo was on ground floor with glass enclosed sunroom. The room is centrally locates next to the pool and playground and only a few steps away from the private dock. This was truly amazing and we could not have asked for anything more. Also, to get to the strip was only a short drive. So much to see and do we will definitely be back and would love to stay in Condo B-1! I've stayed here about 5 times.... I love this place! Very clean unit, well furnished and comfortable. The staff is always extremely helpful and friendly. Great place for a family vacation or weekend getaway.